A roman blind is actually more of a curtain, because it is made from soft, un-stiffened materials. 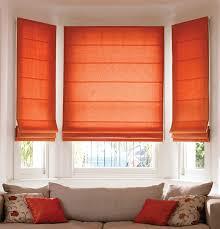 Most roman blinds are lined with another soft cloth to give depth and weight to the product. First Choice Blinds roman blinds, are ‘locked-off’ by an integrated venetian blind cord locking mechanism. Others have an ‘endless chain’ loop, much like a roller blind. This mechanim gives the smoothest operation. 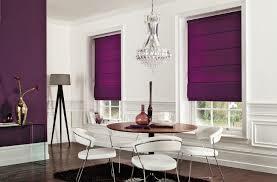 First Choice Blinds Roman blinds can be drawn up or down, and can be locked-off at any intermediate position. Excellent glare reduction is achieved just by using the standard ecru lining. 80% blackout effect can be achieved by using the blackout lining. Most fabrics can be either dry cleaned or machine washed. A translucent lining that adds a heavier feel to the fabric. A coloured lining can be chosen to compliment the main fabric, or to affect the look of the blind from the outside of the house. A heavy duty Headrail which incorporates a side chain for the raising/lowering of the blind. Note: this Headrail will create a gap of approx 10mm on the control side of the blind, since the control cannot be covered with fabric. There are maximum and minimum sizes to observe for every different roman blind product. Please check the specification for the product you are interested in. The height of two blinds made to the same size may not necessarily sit at exactly the same level as each other, because they are made from soft cloth. Some adjustment in the height is possible by removing the fabric from the Headrail, and re-positioning it on the Velcro fixing of the Headrail. A roman blind is actually more of a curtain than a blind, and will act accordingly. Fabric may stretch and change shape over long periods of being left in the same position. The wider the blind is, the more cords are needed to raise/lower the blind. This can make the operation of larger blinds more difficult to level off. 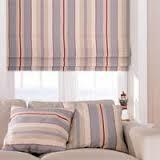 Roman Blinds are very suitable for bay windows. A standard lining is good enough for a dim out effect; alternatively, a blackout lining doesn’t allow any light through the blind. Please note: A 100% total blackout cannot be achieved since there will be light passing in around the edge of the blind/recess. Also, there will be light gaps between blinds on bay windows. Usually fitted to the Pvc frame of the conservatory. 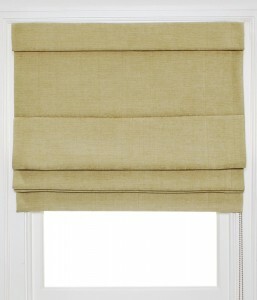 It is expected that the fabric may slightly touch the opening window handles when raising/lowering the blind. Not ideal where head height is restricted, because a roman blind usually stacks up to a minimum of 160mm. If you would like to fit a blind to a patio door, then it’s recommended that you allow an extra 160mm minimum above the door, and fit it there.